No more buying horses for me at least for the next month or so! Really… 🙂 I need a break and I need time to focus on Gib and Letterman. I thankfully sold Catch Ya Later and Mister P J this week which was perfect timing because yesterday when I got home my barn had flooded and their stalls were 4″ deep in water. The tax ditches all around our area were actually overflowing onto the road. My fields looked like lakes. It is a mess but hopefully will drain off in the next few days. Catch Ya Later will be hunting with Wicomico Hunt. 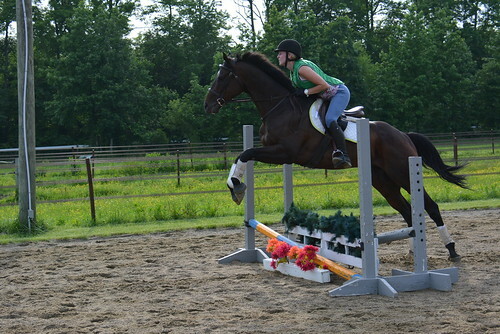 PJ will be doing some hunters and also hopefully hunting, trail riding and just being an awesome all around horse. They were both amazing horses and their new owners are thrilled. Elusive Sky has totally turned the corner. He was one that I bought in late March off the track and he experienced the big crash. He wasn’t in good condition and he was just miserable. I realize how easy it is to transition the canter horses to their retraining because they have already had plenty of time off when they come to me. This guy needed time! His body hurt him and he wasn’t exactly pleasant for a while. He was sweet as can be on the ground but when your body hurts you tend to not want to be touched. He was allowed to have a light work schedule to give him time to physically and mentally heal. Now he thinks he is pretty darn awesome. We figured out the one thing he loves more than anything is jumping. This horse seriously perks right up when he sees a jump. We haven’t done really much flatwork because his body is still healing but jumping allows him to build muscle while going forward so we work with it. He is starting to put on weight and muscle. He loves trail riding and going out and about. 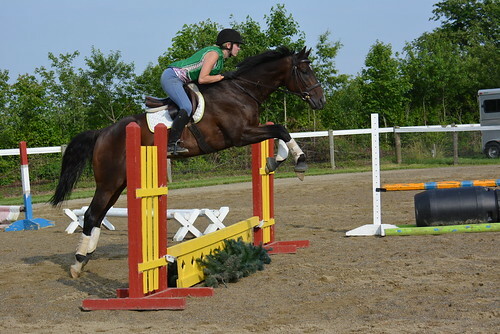 He is going to be an eventing machine. The girls have been riding him for me because he really did need a lighter rider for a bit while his back muscles got stronger. Letterman has been excellent. We are starting to smooth out the canter! Gib has been working hard with some lunging just to get him more consistent. I feel like riding has been hit or miss due to the amount of rain that we are getting. Something crazy like 10″ in the past few weeks. Enough! I want to give myself less work so that I can really focus on Gib and Letterman. Sales are great $$$ but they keep me so busy that I often don’t get a chance to ride my own horses. I think Sky will sell here shortly which will put me at a very managable number of personal horses (right now I have 2 personal horses (junior & letterman) and 2 resale horses. Gib stays until the end of the makeover so at least until October. Ridge is my only boarded horse. Six horses is our magic number in terms of ease of work. If Sky sells I will likely bring a CANTER horse to keep it at 6 horses. Maybe if something perfect comes along I will get one more resale but we will see. I keep that fairly open-ended because it really has to be a horse that speaks to me. See..I am already talking about possibly buying another. I need to learn self-control but that was very apparent when I picked up yet another cat over the weekend. My husband will soon ban me from all thoroughbreds and cats. Long story short we had went to dinner in Wilmington and on the walk back to our car this cat saw me crossing the street and gave me the “look.” I stopped to acknowledge him but he then proceeded to follow us for the next 10 min. Kurt tells it like I kept slowing down to egg the cat on which may or may not be true 🙂 Kurt pleaded with me to keep walking and ignore the cat but I think he knew that I had already made my mind up. Poor Tom Cat was so skinny, covered in bites from fighting, had ticks and fleas and in need of some quality care. I picked him up and he just let me carry him to the car. Kurt doubted this cat would ride in the car but he rode the 1.25 hrs curled up on my lap. He was so hungry that he dove into his wet food and then ate his dry food too! Drank a whole bowl of water. Poor cat! Thankfully, he understands the litter box. He is in the quarantine room and has an appointment for a snip job on Tuesday 🙂 We are calling him Willy and Kurt secretly loves him. I am sure I stole this cat but if he did belong to somebody they didn’t deserve him. He is the friendliest cat! Letterman has been doing quite well as he has returned to work. We had been working very hard on getting him supple in his body before his time off and thankfully he retained most of that. I have felt that the walk and trot have been good but the canter has been tough. I have been able to get him softer in the bridle in the walk and the trot by being able to soften his neck allowing me access to his body. In the canter he just wants to block me. We headed off with Letterman, Gib and Junior on for company. Letterman was first up and came off the trailer a bit jazzed up. He was freaked out and I should have not tied him to the trailer..famous last words. Something spooked him and he broke the snap on the lead rope and got loose. Thankfully he just took a tour of the sand ring and let me catch him after a few minutes. Letterman…gosh he is such a brat. We started out really working to get him straight in his body when going left. 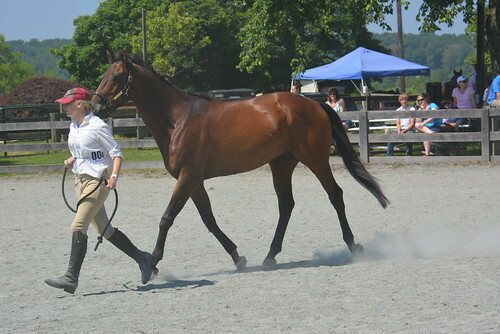 Little bit of counterbend and lateral work to move him from the right leg to the left rein. Focusing on making sure that I was straight and not letting him just grab the left rein. 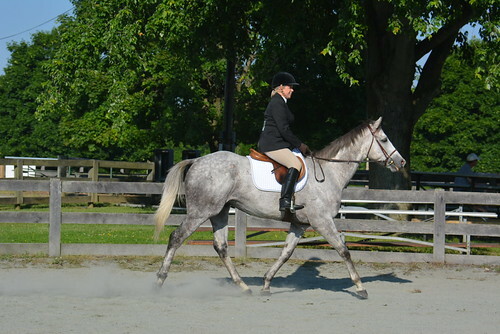 Do I have him on the right rein and can I control the right shoulder? Worked on picking up that right lead. Using a bit of an overbend going right so I can slid him off my right leg. Scooping with my hip to pick up the canter. 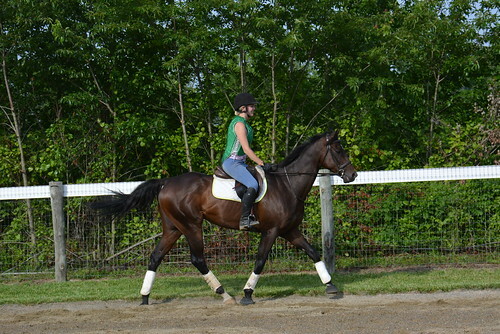 I need him to be more available in his right side so that is something to work on in this canter. The left canter was a hot mess. I had been doing a bit of counterbend but it wasn’t working. He was going so high he could just avoid me. She got on him and said that she was wrong and the issue was more of a left rein issue. Every time she touched the left rein he inverted or grabbed it and ran. She worked and worked on it with a bit of success but that was my homework. Overall, I was thrilled with Letterman. My blog readers know what a journey he has been especially on the flat. He feels so good you all just wouldn’t believe the difference. He used to be so hard in his mouth and just stiff. Now he feels so soft and I can move him all around with just a light touch of the leg. It is all going the right direction. I wrote about Gib on my makeover blog so I will like you there to go have a read. Poor PJ was dealing with an infection after his castration but we have it on the mend. He needs to do some form of work every day where he has to move around. There was a lake in the ring yesterday but I figured it would just be good training for him. Of course he didn’t care and just thought it was a fun adventure. I absolutely love the brain on this horse. He is just so eager to please and so happy about life. He is up for sale although I haven’t advertised him yet. I see him doing well in the hunter ring. He just has the right attitude and movement for it. I hope to get him in the free jump chute this week. We had planned to take Elusive Sky, Mister P J, Gib, Letterman and Ridge. Sky developed an abscess at the very last-minute and PJ is still dealing with complications from getting gelded. We packed everything into one trailer and headed to thoroughbred show in Bel Air, MD. Mid Atlantic Horse Rescue was hosting and I can only imagine the amount of work that goes into hosting one of these shows. I know that Wicomico did an amazing job hosting the show that benefited CANTER. Amanda was going to ride Letterman because we figured Gib was the wild card. He had been a bit silly at home lately and he just needed to be ridden in a way that gives him confidence. I expected Letterman to be his normal cocky self but he was at a whole new level of Letterman yesterday. It started off in warmup when he came trotting in the gate and did one of his epic spook/spin moves unseating Amanda and then running all around like a total dummy refusing to be caught. Way to clear the ring, Letterman! Gib thankfully did not toss me and we all managed to get it together. Sorry to everyone that we upset. Green horses are unpredictable and things happen. 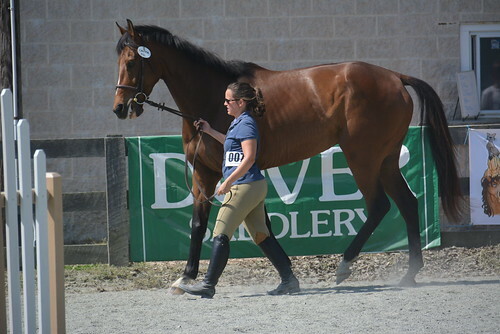 Ridge Amour was being shown by his new owner who was fairly nervous but I think she realized she got the bargain of the century when he just looked at Letterman galloping around and rolled his eyes. What a stupid horse…Ridge has no time for dummies. Letterman did just fine once she was back on. 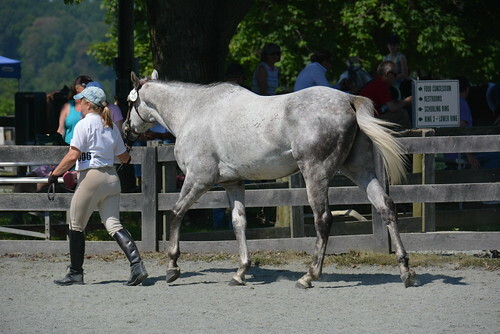 All the horses showed in some in-hand classes. A good way to get them used to the show ring. 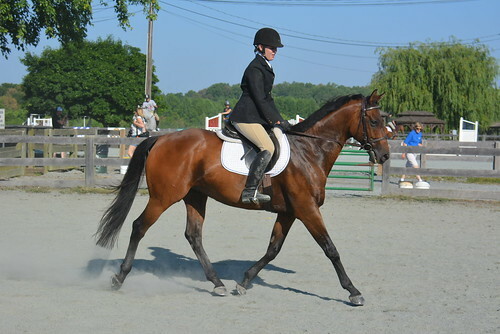 Letterman did the war horse class which had over 20 horses in there. He didn’t place but we were all thrilled with Sue Smith (Canter PA) won it with her lovely horse. He was gorgeous!!! Letterman was still wet from the sponging we had to give him after he got so worked up. 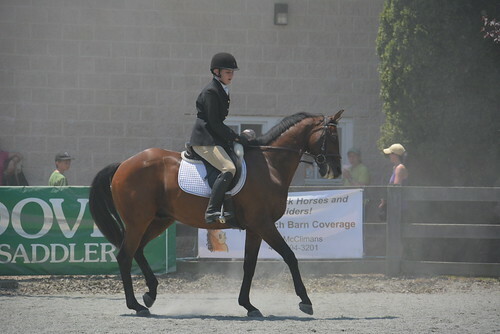 We entered Letterman, Gib and Ridge in the in-hand class for adoption owned horses. Letterman was 3rd, Ridge 4th and Gib was 5th. We put them all back on the trailer and then we all decided to just do the same division because we were hot, tired and wanted to go home. Hunter shows kill me 🙂 Eventing seems much easier to me! 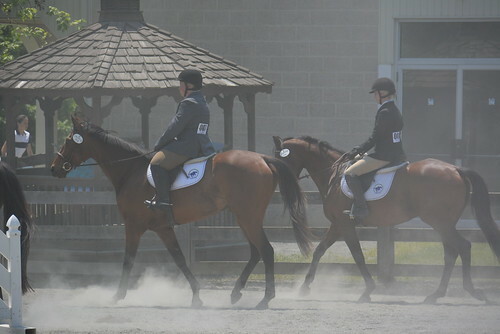 The division was a walk, walk/trot and trot poles. Ridge got 5th out of 19 in the walk class but got a fly on him and started bucking during the trot class. Gib was absolutely awesome and while he didn’t place he totally blew me out of the water being so relaxed in such a huge group. Letterman..let’s not talk about Letterman anymore in this post 🙂 He was just not having any of this stupid walk stuff and started to wind up not down. He went back to the trailer because at that point I couldn’t watch him and give instructions on how to get him to behave! Doris said she actually tried when she got called for a ribbon in that huge class. I am so proud of her! She really has developed such a bond with Ridge and he is a wonderful horse. I am so happy to have both of them in my barn. I found myself laughing hysterically when I saw this picture of Letterman. Yep, that about sums up his day. Poor Amanda! Letterman and I have a lesson with Kelly next weekend..pay back Letterman! 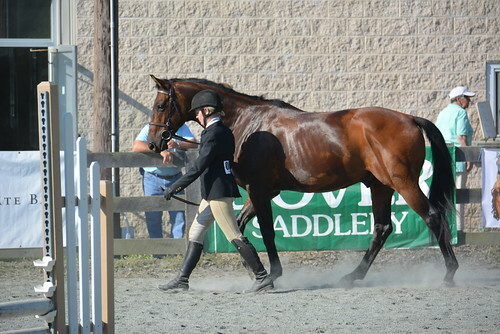 Great show and it was so much fun to see all the gorgeous thoroughbreds!